You have heard the stories of how a split decision can change a person’s life. For Kacey Johnson a choice to remain at school during her lunch hour left her fighting for her life. April 20, 1999. Kacey was a junior at Columbine High School in Colorado. She had been searching for her best friend. Their daily routine included trips to Kacey’s parents’ home where her mom would have sandwiches and cookies ready for lunch. However, on this day, her friend could not be found. So, instead, Kacey made her way to the library to read a magazine. A quiet moment led to chaos when a teacher burst through the doors screaming at the students that two boys were outside with guns. Taking shelter under a table, Kacey began to pray for safety, a slideshow of her life on display in her mind. “I felt a hand on my shoulder, I turned around and realized no one was there.” The hand she felt acted as a blanket of peace. As the shooters entered the library she knew her turn to be shot was coming. She continued to pray. Minutes later, Kacey was face to face with a gunman. A single close-range blast from a shotgun burned a path through her right shoulder, wrist and across her neck. She fell forward, the wind blown out of her from the impact. Knowing the shooters were relentless, her only hope was to hold her breath and pretend she had died. Fortunately for Kacey, the shooter moved on. “At this point adrenaline kept me going. It was fight or flight mode,” says Kacey. Another student helped Kacey to her feet. Nearly 15 minutes later she reached the safety of a triage area set up in a person’s yard nearby. An off-duty nurse could not hide her true feelings; avoiding the question from Kacey about losing her arm, she simply stated that surgery would be right away. Kacey was rushed to the ER, her wounds and blood loss were reaching critical levels. Doctors across the nation were consulted to come up with a plan, amputation of her right arm being an option. A few days later a surgeon in Denver suggested a revolutionary surgery that would use an allograft to replace the missing bones in her shoulder and hand. The idea was new to Kacey’s family as they had never heard of an allograft, which is donated bone and tissue. Kacey was in no shape to make decisions and her parents expressed concern about the procedure, though Dr. Ross Wilkins felt confident in his suggestion, using donor bone and tendons to rebuild Kacey’s arm and thumb. Almost twenty years later, Kacey still has the life-enhancing donated bones that helped to save her arm and gave her a second chance at a full life. Kacey spent many years recovering physically and emotionally from the incident. However, through the years, as she spent time as a oncology RN and became a mom, her gratitude for the gift given to her developed a great appreciation for her donor. Realizing how different her life would be without the donated gifts, Kacey now has a passion for sharing the life-changing impacts of tissue donation. “I live the blessed life of being a recipient every single day; how very different my life would be without two arms,” she says. Kacey is now married to Patrick Johnson, the Director of Tissue Services with Carolina Donor Services. The two were engaged when Patrick surprised Kacey with a proposal when she was a featured rider on the Donate Life America Rose Bowl Parade Float in 2005. Patrick’s passion for organ, tissue and eye donation grew as he walked along Kacey; both of them deeply thankful for the life provided by such a gift. Patrick and Kacey are blessed to have four children. She is grateful for the chance to hold their hands, to be involved in their activities because of her donor. 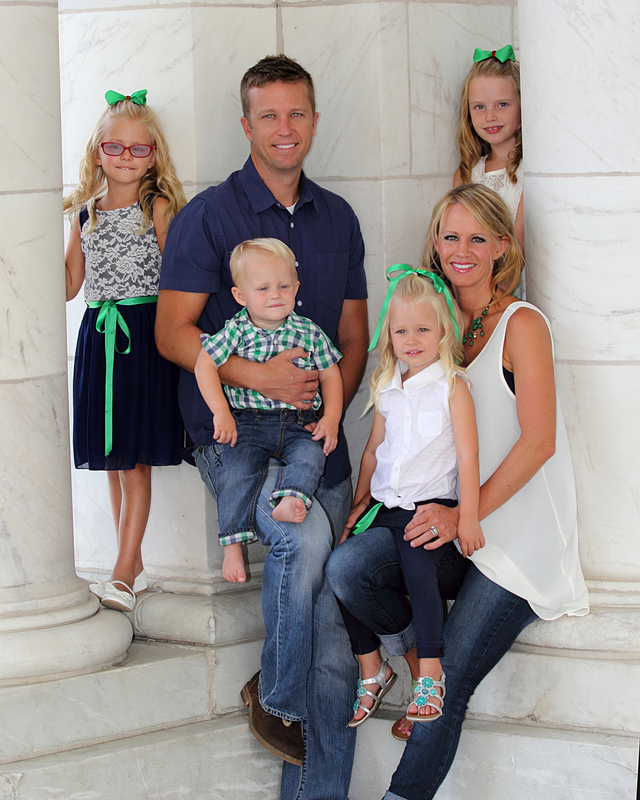 “Being a mom has opened my eyes to the choice the family of my donor made. While enduring probably one of the worst days of their lives, they found courage to allow the story of their daughter to continue in the life of another,” says Kacey. “She’s become a full character in my story. I am honored to carry such a gift,” she says. Kacey believes the story of her donor continues on through her; on ongoing Gift of Life. New heart recipient Brian Bourgal shares his transplant story in honor of Donate Life Month 2019! Join WELD member Dori as she explores Chicago for the 2019 Living Donor Reunion! Living kidney donor Dori is attending the national Living Donor Reunion in Chicago and taking us along for the ride!